The basement is a generous 60m2 and is a great place to relax. It has a built-in jacuzzi (with heating), a built-in sauna room, which is large enough for about 4-6 persons. Various training and fitness machines are also located in the basement. The basement was designed with attention to detail, it has a very plush interior, with excellent lighting and dimmer switches and the walls are decorated in wood and stone. It also has a de-humidifier, which provides adequate ventilation for the jacuzzi and sauna. The kitchen has a large granite worktop and comes equipped with all mod cons, including a fridge-freezer, toaster, electric hob and oven, microwave, kettle, dishwasher and washing machine. The kitchen units have built-in concealed lighting. There is ample storage space. The sitting room has rattan furniture and also a corner leather sofa and armchair. The dining area has a marble table and brown leather chairs and seats 8 people comfortably. The vertical blinds are operated by remote control. Outside in the garden, there are sun beds and 2 picnic tables. There is a stone-clad barbecue on the veranda and 12 chairs and 2 tables for al-fresco dining. Electrically operated awnings outside on this level protect you from the sun. Here there is a cosy living room with beautiful sea views. Features include LCD TV, 2 satellite TV systems (with a 1.7m dish on the roof), and DVD player. There is also a guest bedroom with a king-size bed, built-in wardrobes and a luxury en-suite bathroom. Next to the living room, there is also a walk-in store cupboard. All of the bedrooms benefit from en-suite bathrooms, which are really quite luxurious and include marble sinks, designer fittings, halogen lights, etc. There are 2 master bedrooms with breathtaking sea views, one of which has a luxurious jacuzzi bath with a sea view. The bathroom in bedroom 1 also has a sea view. All of the bedrooms are very spacious and they all have built-in wardrobes. 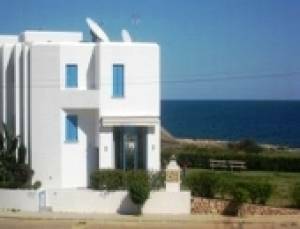 This house is a fabulous investment, both as a rental property or family home, because seafront land in Protaras has run out so prices are certain to keep rising. In addition, it is a very unique house due to its size. It is very rare to find such a large house right on the beach. The covered area of the villa is 320m2, including the basement and the plot is approx. 1,400m2. There is a skylight leading to the roof where there is the possibility of a creating roof garden. Although officially the garden in front of the house is in a protection zone so you can`t build anything, once the title deeds have been issued, you can apply for a permit to install a prefabricated swimming pool if desired. Title deeds have been applied for and are expected to be issued imminently. The price includes all of the furniture, electrical appliances, fixtures and fittings. In fact, everything at the villa will be yours if you decide to buy! The villa has central heating throughout plus it has split air-conditioning units for either warm or cold air.